This farmstead was developed between 1897 and 1910 by Wasyl and Anna Negrych and their children. It possesses the oldest known residence in Manitoba built in the Ukrainian vernacular tradition, as well as the most complete set of original pioneer-era farm buildings. The ten surviving log buildings were constructed almost exclusively of natural materials gathered on the homestead. The structures feature many examples of ingenious folk design and quality craftsmanship associated with the self-reliant tradition of Ukrainian peasant society, such as the hand-crafted wooden door-hinges and latches. The 1908 bunkhouse contains a rare example of a handmade clay bake-oven or peech. It also possesses the only known Manitoba example of a traditional eastern-European style roof, characterized by handsplit, metre-long wooden shingles. The Negrych family members were avid horticulturists and maintained several orchards and gardens. The primary orchard, located in the centre of the farmyard, still supports a variety of the original fruit, berry, and herb plantings. 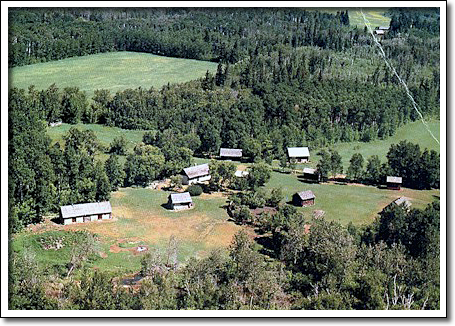 In 1991, Gilbert Plains area residents organized to preserve and restore the Negrych Homestead as a tribute to the family and the Ukrainian pioneer experience in Manitoba.